Reading and share top 3 famous quotes and sayings about Love That Never Happened by famous authors and people. 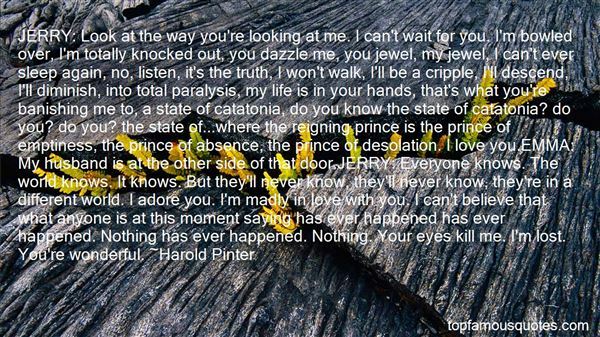 Browse top 3 famous quotes and sayings about Love That Never Happened by most favorite authors. 1. "JERRY: Look at the way you're looking at me. I can't wait for you. I'm bowled over, I'm totally knocked out, you dazzle me, you jewel, my jewel, I can't ever sleep again, no, listen, it's the truth, I won't walk, I'll be a cripple, I'll descend, I'll diminish, into total paralysis, my life is in your hands, that's what you're banishing me to, a state of catatonia, do you know the state of catatonia? do you? do you? the state of...where the reigning prince is the prince of emptiness, the prince of absence, the prince of desolation. I love you.EMMA: My husband is at the other side of that door.JERRY: Everyone knows. The world knows. It knows. But they'll never know, they'll never know, they're in a different world. I adore you. I'm madly in love with you. I can't believe that what anyone is at this moment saying has ever happened has ever happened. Nothing has ever happened. Nothing. Your eyes kill me. I'm lost. You're wonderful." 2. "Boo-Boo Pennyroyal did not like her male and female slaves to mingle. In the operas that she adored, young people brought together in tragic circumstances were forever falling in love with each other and then throwing themselves off things (cliffs, mostly, but sometimes battlements, or rooftops, or the brinks of volcanoes). 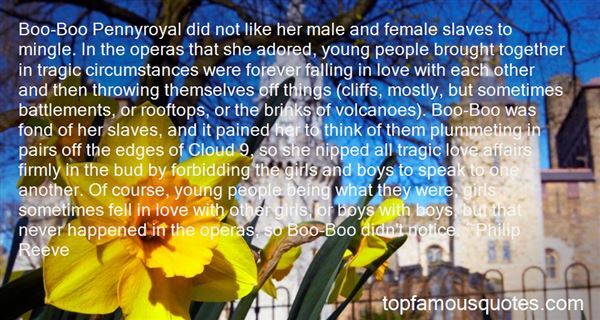 Boo-Boo was fond of her slaves, and it pained her to think of them plummeting in pairs off the edges of Cloud 9, so she nipped all tragic love affairs firmly in the bud by forbidding the girls and boys to speak to one another. Of course, young people being what they were, girls sometimes fell in love with other girls, or boys with boys, but that never happened in the operas, so Boo-Boo didn't notice." 3. "That's the thing of it—the really petty thing of it—I can't help but feel like this wasn't supposed to happen to me. 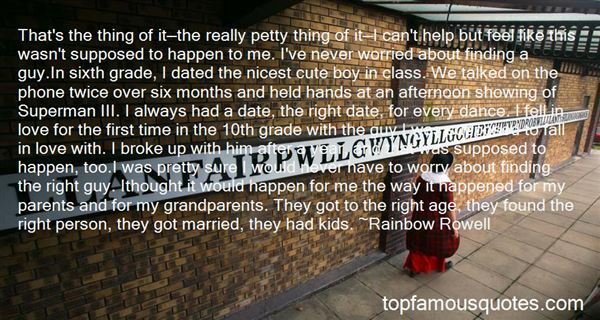 I've never worried about finding a guy.In sixth grade, I dated the nicest cute boy in class. We talked on the phone twice over six months and held hands at an afternoon showing of Superman III. I always had a date, the right date, for every dance. I fell in love for the first time in the 10th grade with the guy I was supposed to fall in love with. I broke up with him after a year, and that was supposed to happen, too.I was pretty sure I would never have to worry about finding the right guy. Ithought it would happen for me the way it happened for my parents and for my grandparents. They got to the right age, they found the right person, they got married, they had kids." Life had taught him about something far more complicated than justice. Its name was balance."